Mattie is a deaf three year old who was adopted by us as we made a wrong turn down the highway on our way back to Palm Springs from Las Vegas. We stopped to fill up on gas and a woman was standing outside of the gas station with a puppy in her arms. When asked about it, she was offering puppies for sale for $50 each. When we saw how vulnerable this dog was in this woman’s arms (the woman was dirty, covered in scabs and definitely had a drug problem), we knew that in the very least we had to rescue however many we could from the conditions they had been living in. The woman took us back to meet the other pups in the litter. There were about four of them stuffed underneath the shirt of the woman’s boyfriend. They were dirty, cold, whiny and obviously miserable. The woman said they were keeping the litter in their garage so I’m pretty sure the puppies were getting into motor oil, antifreeze, and anything else that was lying around on the garage floor. Just one lick to the face and you could smell the motor oil in their breath. We had enough money to take home two of the female puppies who were later named Mattie and Trixie. It wasn’t until about 5 months of age that we noticed that Mattie wasn’t quite responding to our verbal cues. As time went on we figured out that she is almost completely deaf (it may be because of the toxic chemicals that the puppies were exposed to since Trixie also has some vision issues). With some patience and consistency, Mattie has responded extremely well to training and knows a plethora of commands such as sit, stay, down, shake, and come. She also does a good job off leash as we’ve taken her backpacking and mountain biking and love to see her excitement as she explores the world around us. The only thing we need to work on now is to stop her from jumping our 6 foot fence. She’s a pretty darn good escape artist (and athlete). 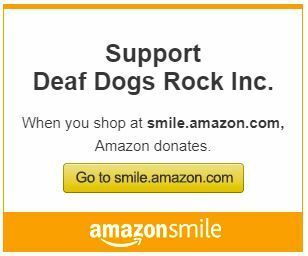 We found the Deaf Dogs Rock website looking for tips on how to remotely train deaf dogs. We now have a vibration e-collar and are working on recall with Mattie. So far so good because she is responding well to her training. Mattie and her sister have formed such an integral part of our family. We’re especially grateful for the added flavor that Mattie has put in our lives because she is sweet, affectionate and very smart. The early morning cuddles are especially the best feeling. I’ve never met a dog who snuggles as well as Mattie does. Photo above: Trixie is left, Mattie is on the right.